How perfectly British, how perfectly Spring, how perfect period. 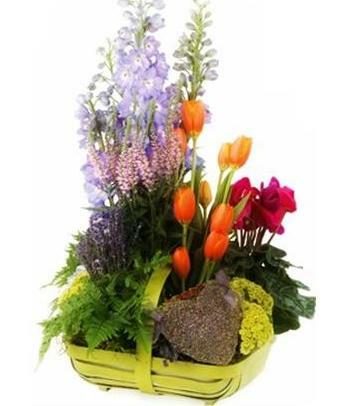 A bright basket filled with both cut flowers and ferns with the plus of a dried, lavender covered heart or egg-your choice or ours. A true English garden design. Just cannot get any more perfect than this one. The basket styles will vary but never the charm of the design. A 10″ basket with a lavender egg $145. A 14+” basket with a lavender heart or egg $260. The scent is unbelievable. *if you are a romantic or a loving son or daughter-send the heart. We can upgrade the smaller basket with a heart for just 15. extra.